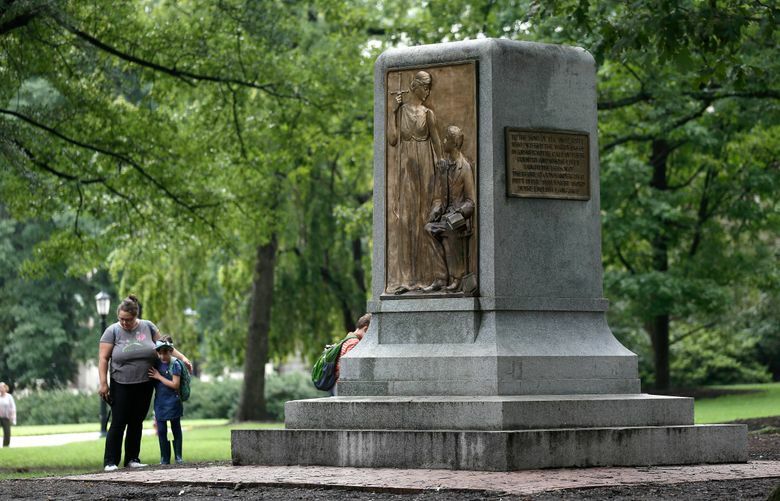 RALEIGH, N.C. (AP) — Police filed charges Friday against three people accused of helping tear down a century-old Confederate statue during a protest this week at North Carolina’s flagship university. 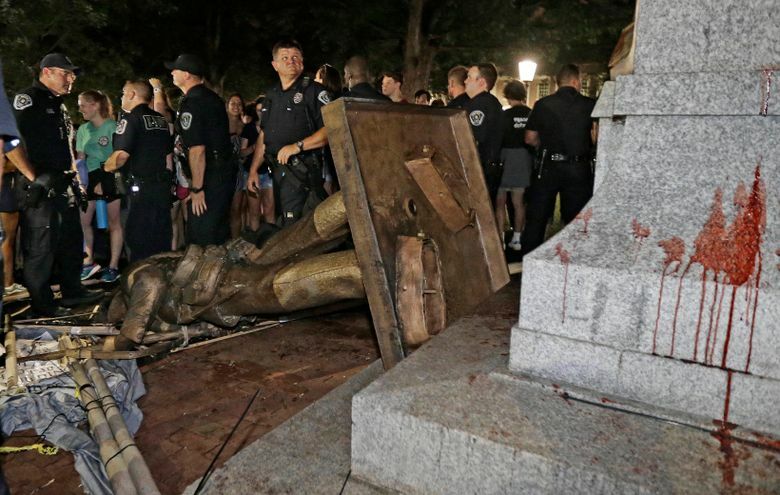 The University of North Carolina’s campus police department filed warrants for the three on misdemeanor charges of rioting and defacing a public monument, according to a news release. The release said the three aren’t affiliated with the university. The suspects hadn’t been arrested as of Friday afternoon, said spokesman Randy Young, who declined to immediately release their names. 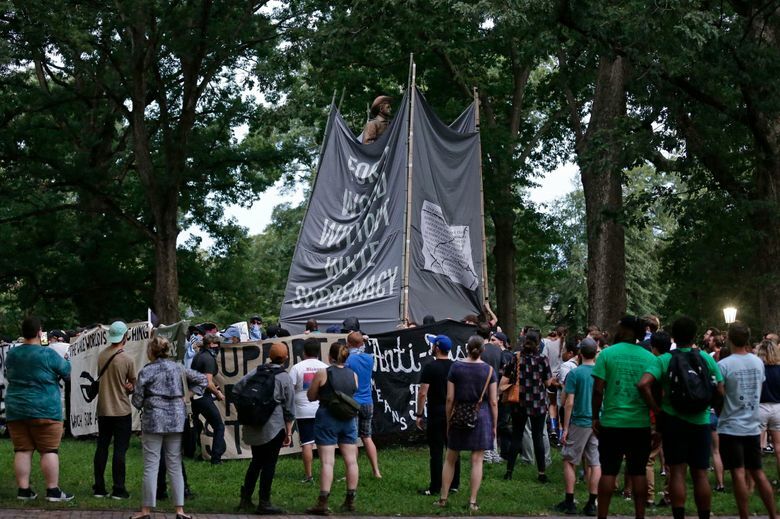 Several hundred protesters on UNC’s campus in Chapel Hill used ropes Monday night to bring down the statue known as “Silent Sam.” The organized protesters took advantage of a non-confrontational police response to topple the statue that stood since 1913 in a main quad. The police response Monday was much different from the response to a similar protest a year ago. In 2017, officers in riot gear faced criticism for heavy-handed tactics after using metal barricades to keep activists from getting near the statue. The portable barriers weren’t used Monday, and officers didn’t keep protesters away from the statue. University and legislative leaders have condemned the protesters’ actions as “mob rule,” demanding a hard look at the police response and a full criminal investigation. The State Bureau of Investigation has been brought in to assist. “That’s a relative slap on the hand based on what they have done,” he said. Last year in Durham, demonstrators tore down a Confederate statue in front of local government building. Law enforcement officers took video but didn’t try to stop them as one climbed a ladder and attached the rope that was then yanked by protesters on the ground. A judge in Durham later dismissed charges against two and found a third not guilty because of difficulty identifying protesters on video. The district attorney then dropped charges against the remaining five, saying he didn’t have any stronger evidence against the rest. In Chapel Hill, university leaders have noted the protest Monday was highly organized and “unlike any” they’d seen before. On Thursday, Chancellor Carol Folt told reporters university officials had expected a smaller demonstration and were taken by surprise. Before it was torn down, it had been under constant, costly police surveillance after being vandalized in recent months. Many students, faculty and alumni argued that “Silent Sam” symbolized racism and asked officials to remove it.